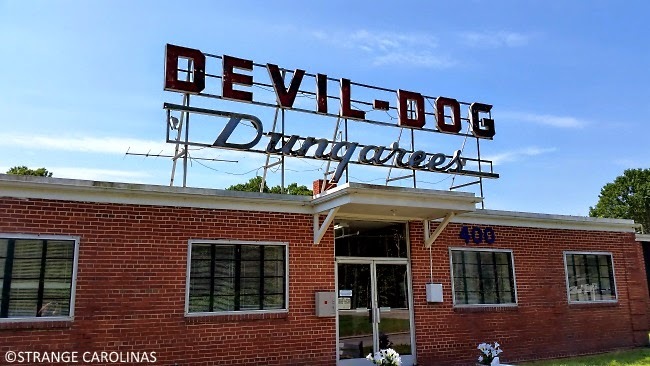 Yes, the sign is cool, but isn't Devil Dog Dungarees the coolest brand name EVER? Sadly, you can no longer purchase a pair of DDDs, but you can still marvel at the awesome sign on your way through Zebulon. The DDD location is in fact opperating as their distribution center. The devil dog clothing line is manufactured over seas. They are branded as, General Sportwear Co. Inc. Thier products can be found at belk department stores. Devil Dog Dungarees brand relaunch coming soon!